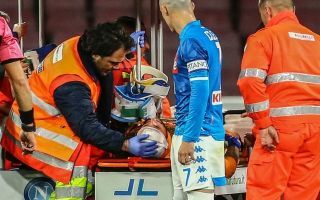 Arsenal goalkeeper David Ospina has had to be stretchered off during Napoli’s Serie A clash with Udinese, the Colombian stopper suffered a head injury very early in the game. In the fourth minute of the match Ospina collided with Udinese striker Ignacio Pussetto after he rushed off his line to attempt to collect a low cross. Ospina then wore a helmet for over 35 minutes before he collapsed to the ground and was stretchered off in the 44th minute. Ospina was replaced by substitute keeper Alex Meret. According to Mirror Football, Ospina was immediately taken to a nearby hospital. The 30-year-old joined Napoli on a season long loan deal from Arsenal in the summer and the Colombian stopper has made 21 appearances across all competitions this season. His displays have helped Napoli to second place in Serie A. Our thoughts are with Ospina, his family and his friends. We hope that the stopper is fine and back between the sticks in no time.